Just one month before he became the first person to die behind the wheel of a self-driving car, Joshua Brown recorded a video of his Tesla Model S’ autopilot saving him from a crash. At least, that’s how he described it. It was The Verge that first noticed the video, which Brown uploaded on April 5. A truck comes in from his left, merges into his lane, and his car alerts him of the impending danger. Brown said that his car swerved to avoid the truck, then he took over and continued to keep out of its way. Tesla Model S autopilot saved the car autonomously from a side collision from a boom lift truck. 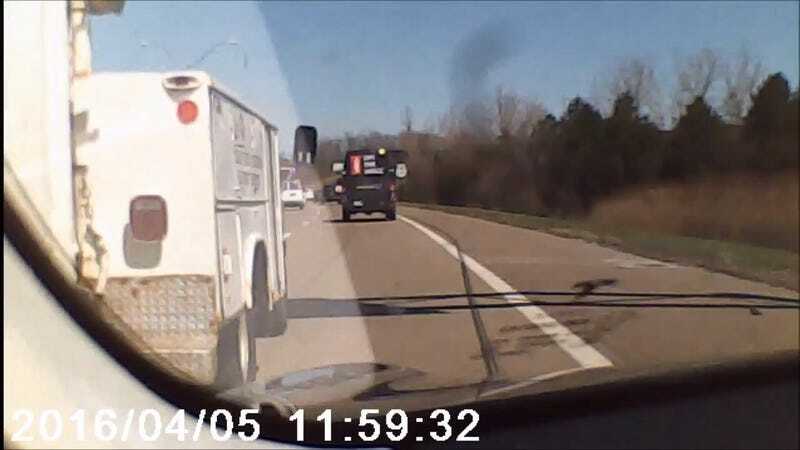 I was driving down the interstate and you can see the boom lift truck in question on the left side of the screen on a joining interstate road. Once the roads merged, the truck tried to get to the exit ramp on the right and never saw my Tesla. I actually wasn’t watching that direction and Tessy (the name of my car) was on duty with autopilot engaged. I became aware of the danger when Tessy alerted me with the “immediately take over” warning chime and the car swerving to the right to avoid the side collision. You can see where I took over when there’s a little bit of blip in the steering. Tessy had already moved to the right to avoid the collision. I was not able to slow down even more due to the heavy traffic (cars were behind me). Once I got behind him I slowly added more room between us until he exited. I was not tail gating after the incident. It was a mistake on the other driver’s part. He did not even know I was there until I honked my horn. There was a group of women in the black sedan to my left and they went nuts about the guy and what he did (all kinds of gesturing in their car). Once I was beside the truck as it slowed down on the ramp, the guy gestured a “sorry!” I gave him, “it’s okay” wave. Note: I have over 39,000 miles on the car and I’ve had it since mid-July 2015. Hands down the best car I have ever owned and use it to its full extent. It has done many, many amazing things, but this was one of the more interesting things caught on the dashcam. Note: it’s a really poor dashcam, so sorry for the poor video quality. Note 2: In case you’re curious, I’m listening to an audiobook in the background. It’s a Malcolm Gladwell book (excellent book). That audiobook is particularly disturbing, discussing someone’s creeping suspicion that another is a killer. The video was even cited by Elon Musk himself on Twitter. Brown’s YouTube channel shows he was an active user and shooter of the car’s Autopilot function; he filmed more than 20 demonstrations of his Tesla driving itself in various scenarios. The Autopilot Save video from April 5 was the last on his channel.